The calories in champagne, wine and other alcohols are considered "empty" because although they provide energy and can lead to weight gain, they have little nutritional value. Typically, wine and champagne have fewer calories than regular beer, sweet liqueurs or cocktails that are made with sugary mixes such as cola or juice -- but drinking more than a glass or two of wine or champagne can still easily push you over your daily calorie needs. A glass of champagne is often the lightest choice at the bar, containing just 84 calories per 4-ounce serving. White wine is also relatively low in calories, containing about 121 per 5-ounce serving. At 125 calories per 5 ounces, red wine is usually slightly more caloric than white versions. Port wine contains 90 calories per serving -- but at 2 ounces, the serving size is less than half that of a regular glass of wine. 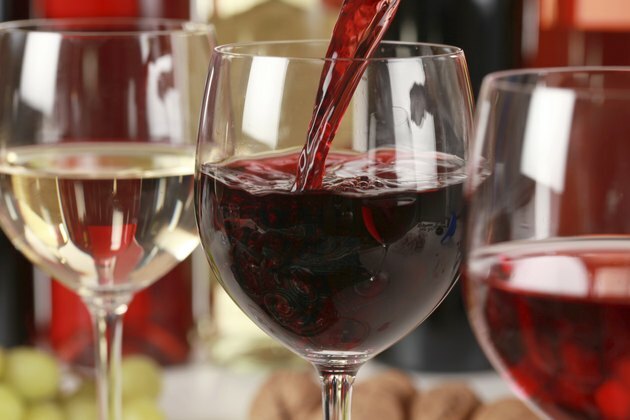 Sweet wine can also get you into diet trouble, as it contains 165 calories in just 3.5 ounces.